Bill Gates is an American computer programmer, businessman and current philanthropist known for founding Microsoft, being the richest man in the world during various years and more controversially, for his cutthroat business practices during his tenure as a Microsoft executive. 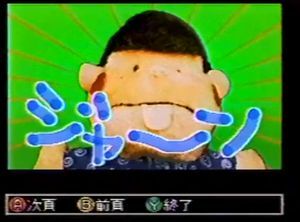 "Bill Gates" shows up in a Shitamachi Ninjō Gekijō, represented by a plush of the titular character of Tensai Bakabon. Bill Gates explains to Mario and Toad the true purpose of Windows 95. In the February 20, 1996 broadcast of Shitamachi Ninjō Gekijō, "Bill Gates" makes his entrance while Toad and Mario are disputing who will get to ride Windows 95 (which they believe to be a vehicle). Toad mistakes Gates for a "beer company poster girl" (a joke on the similarity between the Japanese writing for "Bill" and "Beer") but Gates responds he is wrong. Mario recognizes the man as Bill Gates and both he and Toad ask him to give them money. Bill Gates blankly stares at them and explains Windows 95 is not a vehicle, but "something you wear on your head." The pair dismiss him as an idiot and the skit ends. ↑ Kiddo Cabbusses's Unpoplar Obscurities (January 30, 2019). kukun kun kut - Mario and Toad Use Windows 95? (Lilly Franky 2/20/1996). YouTube. Retrieved March 29, 2019. This page was last edited on April 13, 2019, at 16:27.